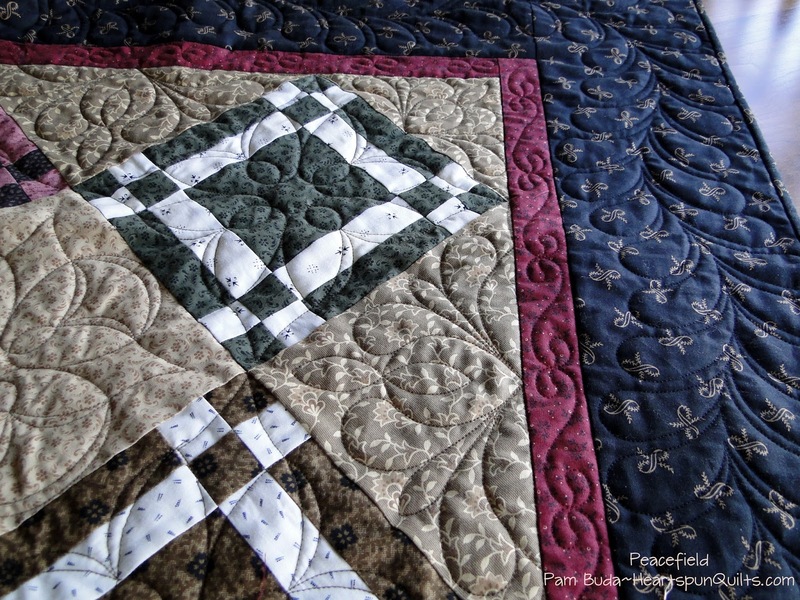 Heartspun Quilts ~ Pam Buda: Peacefield Gets a Make-Over! With the arrival of my new Pam's Prairie Basics & Shirtings collection came the ability to give one of my favorite patterns a new look! 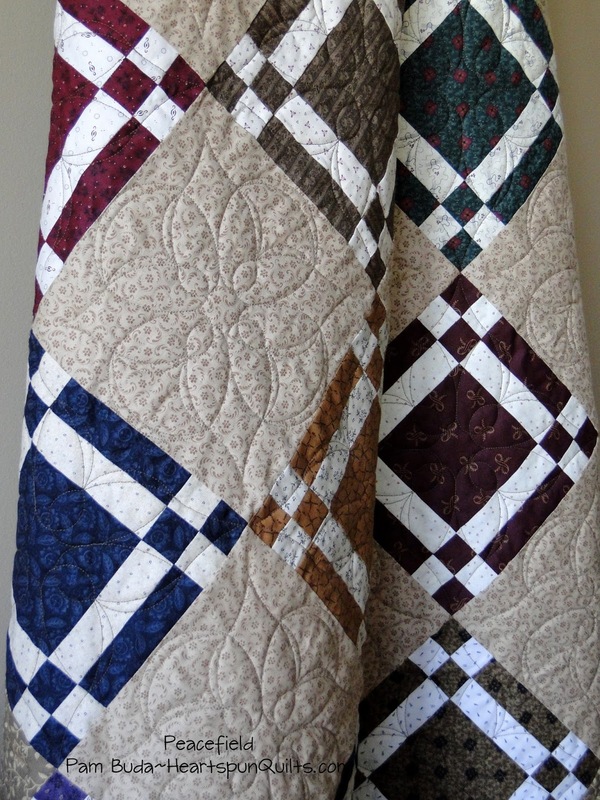 Peacefield is an easy-to-make quilt with a striking traditional block ~ the Windowpane block. The Windowpane block is made entirely from a square and strip sets. And...it lends itself perfectly to a 10 x 10 precut! Prairie Basics & Shirtings 10 x 10 precut. Instructions for making the quilt from your stash are included in the pattern, too. The size of the quilt is 60 x 72....a cozy throw quilt. I just adore the tan setting triangles print and how it separates the beige center, and beautifully offsets the outside blocks. Love, Love, Love!! 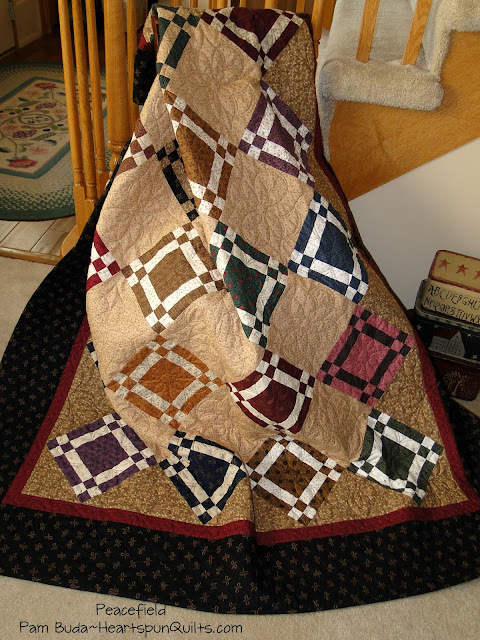 As always, Ronda did a gorgeous job of quilting Peacefield.....don't you agree? Peacefield Quilt Kits with FREE SHIPPING!! Place your pre-order now and your kit will be on its way in early June!! Click here for all the details. Order the Peacefield pattern here. Cottonwood Creek is nearly finished being quilted. We are in a mad dash to get it back so Debbie can bind it, and add the sleeve. Then it's off to have it photographed, packed up, and sent overnight to the folks at Marcus Fabrics in St. Louis. I'd be in quite a pickle without the help of my friends!! Sadly, I will not be attending quilt market this year as it was a decision I had to make in January when I happened to be in the hospital. Not knowing what was ahead for me in the months to come, I had to opt out of attending. The good news is...that I will have 9 quilts on display in the Marcus Fabrics booth!! Yay! With all that happened with the double hip replacements, and subsequent troubles afterward, I have been home for more than 9 months. So....with everyone else going to market, DH and I decided to take a short little vacation to visit North and South Dakota. We've never been there and it will be two more states off my list of visiting all 50 before the end of my 60th year. (I have 6 more to go, including SD & ND, and have some time in which to accomplish this, but not much!) If you have any recommendations of what to visit and what is fun to do in North & South Dakota, please share! We plan to visit Mount Rushmore and Crazy Horse, and pop over to see Devil's Tower in WY. We will visit President Roosevelt's park in North Dakota, and the Badlands as well. I recently heard of Needles Highway, where the road runs through the base of the trees like thread through a needle, and for this stitching traveler, it's a must see and sounds intriguing! I'm just about finished with a new fabric line, beginning ideas on the next BOM, and have been ruminating over a new Sew-Along. I'm feeling better, can you tell? I loved the original quilt, Pam, but this really sings to me! It looks so warm and inviting. Too bad you can't go to market, but sounds like you are going to make the most of the break. I've never been to those states, either--planned a trip once and things came up and we never made it. You pretty well listed the things we had planned to see. So glad you are feeling better. Looking forward to seeing the things you have in the works! You'll be a hop, skip and a jump away from me!! The Black Hills was one of our very favourite family vacations and we did the whole gamut of tours there. The old train, Cosmos, Prairie Berry Winery, Rushmore Cave, rented a pontoon boat on Pactola Lake, went ATVing, did the wooden maze, the Needles highway, Custer State park and then ran out of time!! We stayed at the Lodge at Deadwood and it was a fantastic hotel with big rooms and a really good restaurant. The Badlands is two hours south of us, but we've only driven through them to get to the Black Hills. Medora is a great little town with a musical and a touristy town and its close to where you will be travelling. I'll put my thinking cap on and let you know what else comes to me. When do you plan on visiting ND/SD? And great to hear that you're doing better/feeling better!! Pam, that's a wonderful goal, visiting each state ... have a wonderful, relaxing trip! I'm an east coast girl (that's way over 60!) so no suggestions here except wished I was coming along! 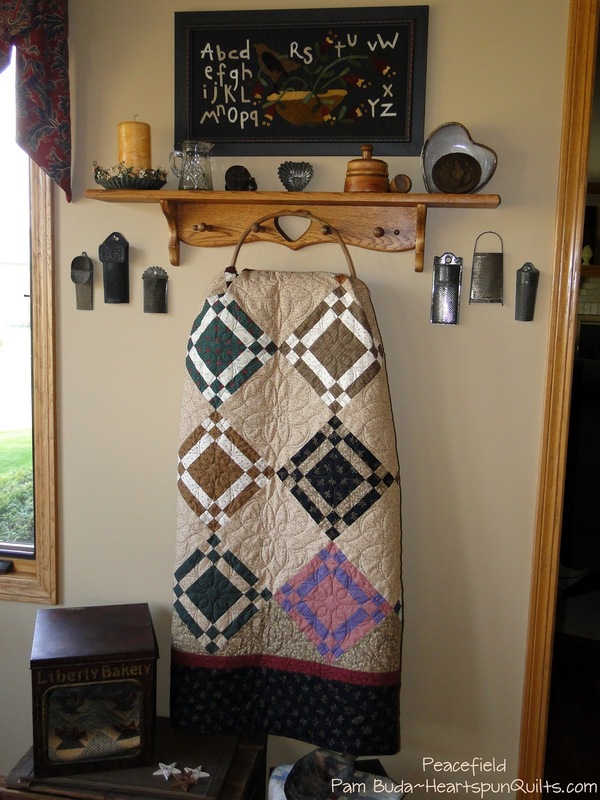 Love the Peacefield Quilt, it's beautiful and inviting! So love your fabric, too! Looking forward to all the new things coming and so glad you are feeling better. OH! Pam ~ I wish I could hide out in your suitcase and make all these fun trips you are planning. What a lovely bucket list you have. Love your make over of Peacefield. Did I hear you were working on a new line of fabric? You are super women!! I will be looking forward to seeing it. When in South Dakota try and make a stop in Watertown to visit the Terry Redlin Art Museum. Great exhibits, beautiful gardens and make sure to see the movie presentation of his life it's such a hearwarming story. Have fun! You will find plenty to do in the Black Hills of SD. Mt, Rushmore, the Needles Highway, Custer State Park, etc. All of that is pretty close together. I plan to go back this fall, and I also need to get to ND which will be my 49th state. Born and raised in SD, but I've never set foot in ND. Have fun!! The quilt is adorable! Cozy and cuddly...well done! Glad to hear those surgeries are behind you and that you and hubby will manage to do some vacationing! Enjoy! 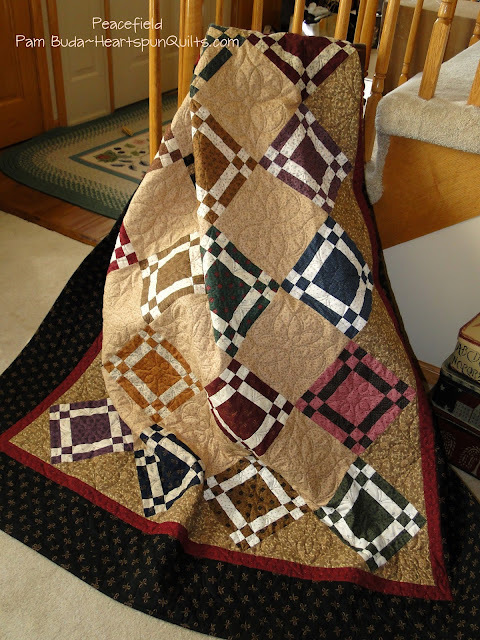 Your quilt looks great - I just love the fabrics - and I can't wait to see it in person at Market next week. Wish I would be seeing you too! Have a fun trip to the Dakotas. We own a farm in ND (my husband is from there), but I don't know of anything near there to visit. There is a good quilt shop in Minot that I visited. They are all beautiful Pam, and your right, I cant choose a favorite either.